Enrollment takes place at our learning center in Tarzana, CA. Please call us directly at 818.292.8008 to schedule your free VIP tour and presentation. 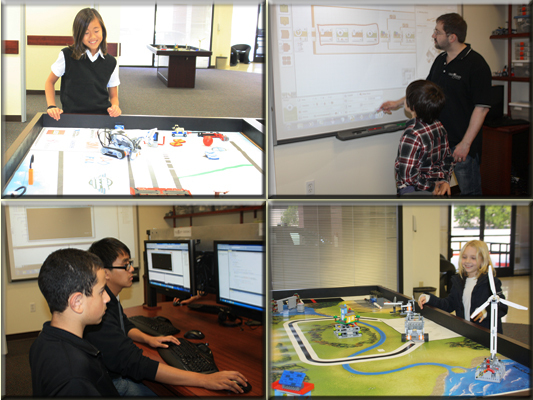 Discover first-hand how much fun your child can have while learning at Great Minds Robotics. Attend your free VIP Tour and Presentation to experience what we teach and how we teach it. There is no obligation to sign up and we're not into high-pressure sales. We're simply offering the best way to discover what happens here. Plan to spend an hour with us and please bring your child along for the experience. You'll get a tour and presentation customized for their grade level. Sign up to try out a class to make sure we are a good fit for your child. The cost is $50. If you choose to enroll, the money you've invested is put toward the first month of classes. We've put together an experience unlike any other and have kept the price in line with the average amounts charged by dance studios, martial arts organizations, and other pursuits in our area. We're not asking that you consider us over them. Our relationship is excellent with surrounding academies and we constantly give and receive referrals. Since we're on the subject of referrals, here's how you can help us and yourself. We realize it's not often you hear six year olds talking about ultrasonic sensors. The next time you do, however, make sure to tell their parents: "Wow! Sounds like your kids go to Great Minds." If they look at you with anything outside of a glowing smile, make sure to tell them about us. If they enroll their child, you will receive compensation in the form of a $35 reduction for one month of tuition or a check of equal value to spend however you like. * We offer a $20 sibling discount for classes. If you have a child enrolled in our classes, you can enroll their siblings at a $20 discount per month. For example: If you enroll two or more children, the first child is $200 a month, the second is $180 per month, the third is $180, and so on. **Workshops are offered to current, paid in full students only. Workshops are 2 hours long.